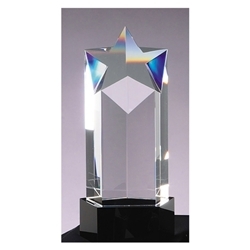 Crystal Star Award with Black Base. This crystal award trophy is sure to get noticed. It stands 8.25" tall and measures 3.5" wide. For the star performers in your organization. We add a silver plate to the base with your free personalization information. Name plate size is approximately 2" wide x 1.25" tall.